E lalawe nei i kuu kino. Ka Nupepa Elele, Buke VIII, Helu 4, Aoao 4. Iulai 24, 1886. Select committee to decide whether to protect birds, 1876. The bill to protect the oo, iiwi, mamo, and akakane birds for the king, so that they are not killed, was read for the third time. It was left to the select committee [komite wae], Kaai, Aholo, Kahanu, Nahaku, and Wana. 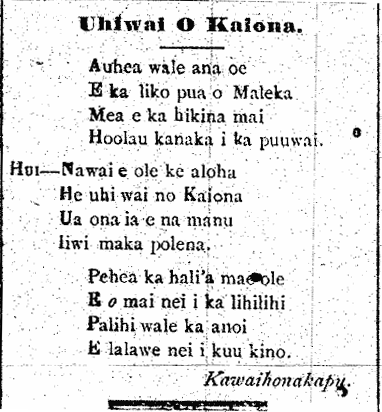 Ka Nupepa Kuokoa, Buke XV, Helu 36, Aoao 1. Sepatemaba 2, 1876. Nene being cared for by Herbert Shipman, etc. 1941. Last week, two men living and working at the Kilauea National Park came to Honokaa School, their names being Gunther Olsen and friend. The school was filled with its 496 students from 1st grade to 6th, to see pictures of the mountains of this island. Olsen described the different birds while his companion showed pictures of the birds on a white cloth. Truly beautiful were the pictures of the mamo, O-o, Elepaio, Iiwi, Apapane, and so forth. The names of the birds of ours were clearly pronounced in Hawaii by that man. According what was said by this man, in Keaau is being cared for at the home of Herbert Shipman, NENE birds, which are believed to be going extinct, but they are increasing. Our birds were much more beautiful in the olden days before other birds were imported from all over, the birds that are a problem for the crops growing in our gardens. They eat flowers of the peppers [nioi], and that is why the nioi doesn’t fruit as they did in years past.